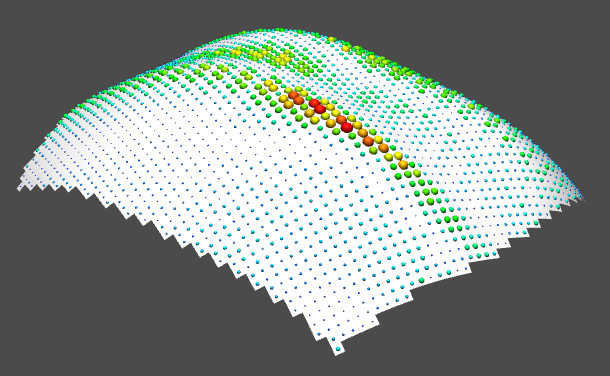 Data visualization is one of most important tasks when doing surface optimization. On the basis of the analysis of data on the surface we decide what parameters go into the optimization and how the optimization core is performing. In this post we introduce the basic visualization features of VaryLab to you. In VaryLab data visualization comes as a build in tool-kit, the halfedge data visualization panel. The basic idea is that data sources provide data for the nodes of a surface. 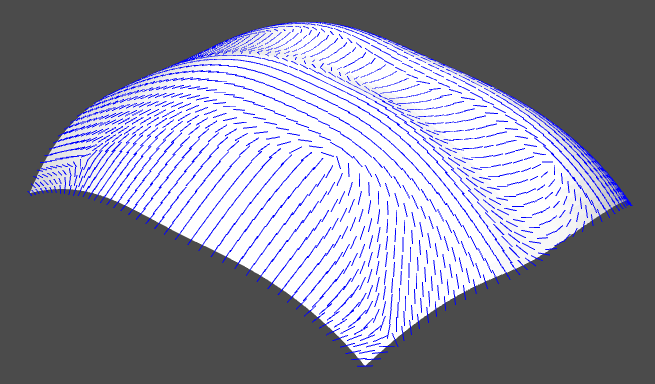 So there are data providers for vertices, or edges, or faces, or all at once. These data providers deliver their data to visualizers that in turn have sockets that take data for vertices, edges, or faces and create their visualization. Select a data source from the middle of the panel. In the right box the compatible visualizers are presented long with buttons for the suitable node type. Click the node type button to activate the corresponding visualizer for this type of nodes. E.g., to show a face area visualization select the FaceArea data source and the blue face button next to the node colors visualizer. The active node colors visualizer is listed in the top-left box along with its options. There are a number of basic data visualizers contained in the module set of VaryLab web service. Colored nodes are a very effective way to represent scalar data on nodes. The nodes are colored using a color map. We mostly use the hue and red green color maps. This visualizer should be used in conjunction with the histogram to connect the colors with the function values. Similar to the node colors this visualizer represents scalar functions on surface nodes. In addition to the color the size of the spheres indicate the value of the function. There are options to adjust the overall scale and the span of the sphere radii. As for the node colors the color map can be chosen. The histogram shows a discrete density plot of scalar data on surface nodes. 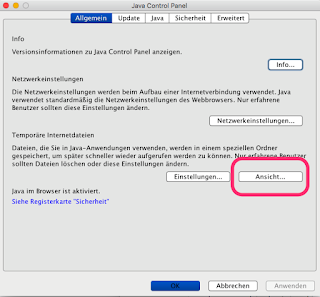 It is integrated in the visualization panel in a tab behind the configuration. The color map can be adjusted to match the colors of a colored nodes or colored beads visualizer. 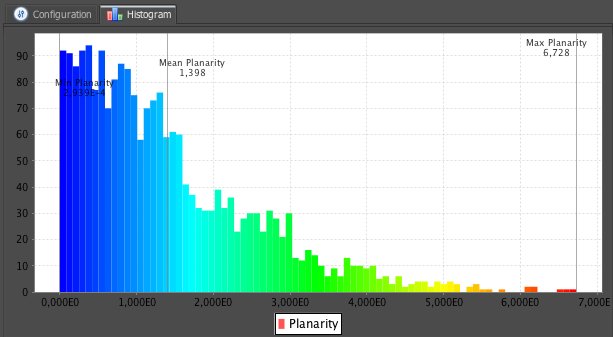 The number of bins that are used to create the density plot can be selected from the visualizer options. Vector data on surface nodes can be displayed with this visualizer. 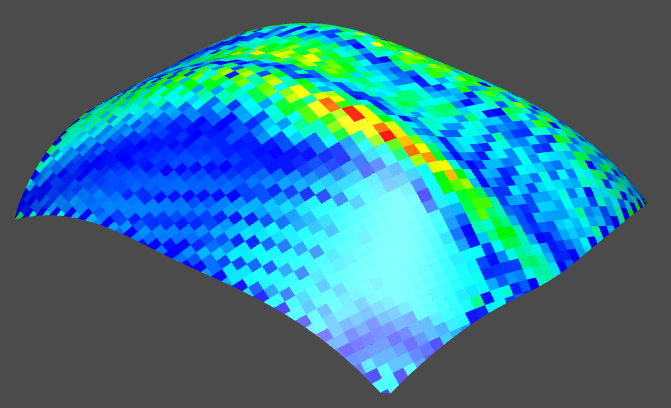 In VaryLab this is mainly used for the visualization of principle curvature directions and their singularities.